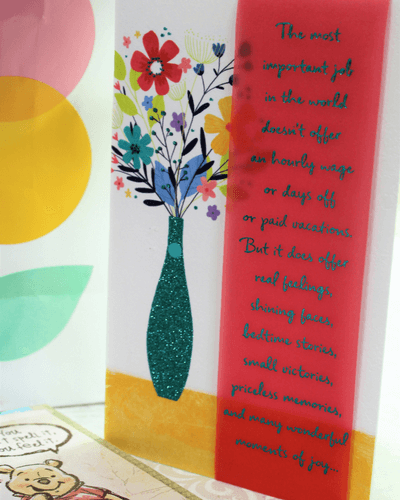 How to Make a Cake Pop Bouquet with American Greeting’s gift bags, tissue paper and delicious strawberry cake pops. Mother’s Day is only a couple weeks away and we are celebrating all the Mother’s in my life. My own mother, mother ‘n’ law, sisters, grandmother’s, neighbors, friends, coworkers and all the moms I call family need to be shown generosity and appreciation. 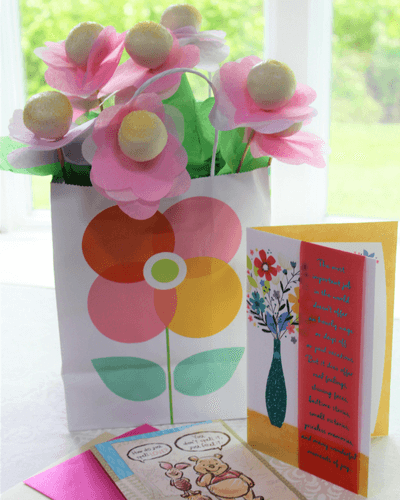 What a better way to do so than a lovely bag of cake pops flowers. Now, this is the type of flower bouquet I want to receive! You can find more creative Mother’s Day ideas by clicking HERE. There is a card promotion for American Greeting’s, “Buy 3 cards, Save $2” going on until May 14th. Look for the signage within your Army and Air Force Exchange Service on base. At the Wright Patterson location, there was a large stand right next to the checkout that you can’t miss! I decided to get married at the age of 19 and be a military wife. For over a decade the past few years, we have moved numerous times and I have been miles and miles away from my family for basically all of my adult life. I live in Cincinnati, Ohio at the moment while my husband does recruiter duty and my family is about 2,500 miles away in Portland, Oregon. Family begins to have a different meaning with all the distance and I have come to love that. Family is the people you spend 4th of July and ring in the New Year with, the neighbor that comes over to put up and take down Christmas lights while your husband is away on orders, the husbands coworker that shows up on your door on Thanksgiving because they too are miles away from their own families. 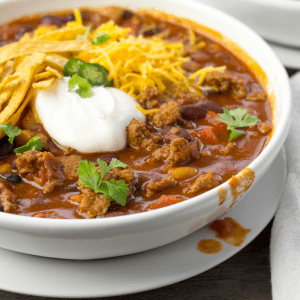 The military is why I started cooking a lot and probably the reason I have a food blog today. I think I hosted my first Thanksgiving dinner at 20 years old so everyone would have a place to go. When we were younger, there was always a guest at our dinner table and the door was always open. We still have a open door for anyone but as we have gotten older, people have married and spend more time with their own children. Our military family is still near and dear to us and today, I am showing you a creative, simple and completely yummy way to tell the people you call family that are grateful for them. 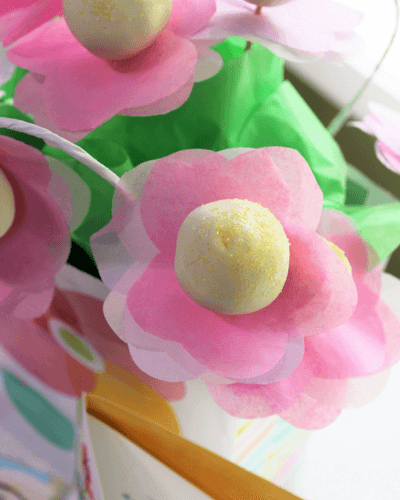 You don’t have to be super crafty to throw this Cake Pop Bouquet together. Seriously, you don’t. The most difficult step will be dipping your cake pops. The trick is to use a chocolate that isn’t too thick and do not overheat it. Also, realize all the cake pops may not turn out perfectly smooth. Mine never do. That is okay! It will still look great and we are using fun sprinkles on top that will hide any bubbles and oddities. American Greeting’s tissue paper. The large sample pack was the best deal and comes with multiple colors. I used the pinks, purples and greens today for the flowers and to fill the bag. American Greeting’s gift bag. I picked a small-medium sized bag with vibrant colors. Pick the bag you like. If your bag is large, you may need to adjust the recipe to double the amount of cake pops. 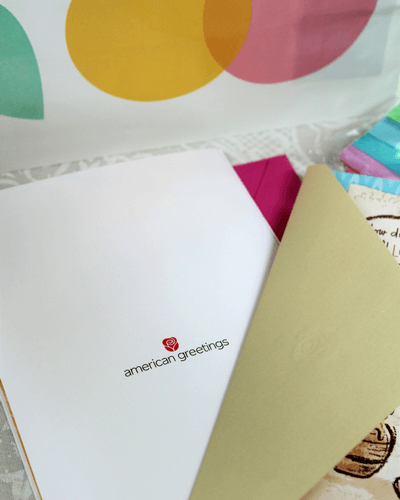 American Greeting’s cards. 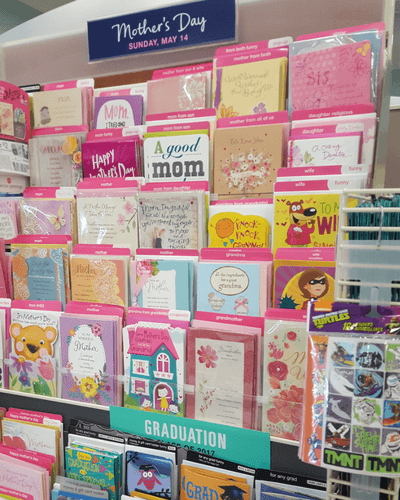 Grab a card for all the mother’s you want to show appreciation for this Mother’s Day. Think about upcoming events too. 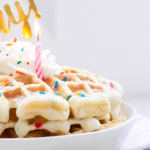 Graduations, birthdays, teacher appreciation and more. There is a great selection for all occasions. Foam block. Found in the home and garden area. Strawberry cake mix and ingredients needed from instructions on back of box. Wooden skewers. Make sure the skewers have one dull end and one spiked end. White chocolate for melting. Remember, thinner chocolate is better in this case. If you heat your chocolate and find it is too thick and weighing down the cake pops, you can thin it out with a tad of vegetable oil. Yellow sprinkles to dress up the cake pops. Mug or glass bowl for dipping cake pops. I recommend the glass because it stays warmer longer than plastic and will help the chocolate stay melted as you finish dipping. Eggs, vegetable oil and anything else your box cake requires. Cake pan. I use a casserole dish. Cookie scoop or cake pop press mold. Gather all the ingredients, materials and kitchen gadgets from the lists above and create your beautiful cake pop bouquet. Don’t be intimidated by how many steps there are. You can do this! Bake your cake according to box directions. Cook for the minimal amount of time. When the cake has cooled, cut into 4 pieces. I used 1 piece (1/4) of the cake to make 8 cake pops. An entire cake will make about 32 cake pops. I place the cake I am not using into the freezer wrapped in foil to use at a later date. These directions will continue for 8 cake pops and you can easily double, triple or quadruple the amounts for multiple gift bags. Place your piece of cake into a bowl. Remove any pieces that look overly done or browned. Crumble up using your hands. Add 1/4 cup of the strawberry frosting and mix, squish and smush well. 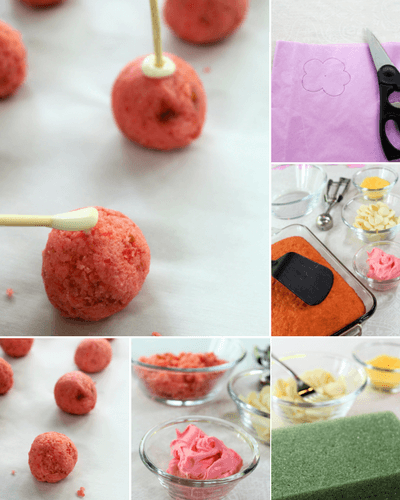 Use a cookie scoop or the cake pop press mold to create your cake pops. I like to use the cookie scoop to ensure each cake pop is approximately the same size and I squish each on in the palm of my hand and roll it into a ball. Place each cake pop onto a cookie sheet. Place the cookie sheet with the cake pops into the fridge for an hour to chill. 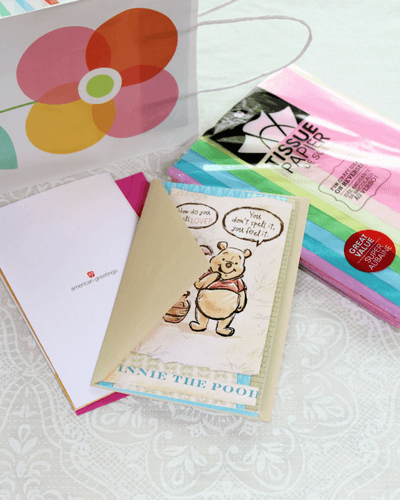 As the cake pops chill, you can cut your flowers and write your own personal messages in the cards. To create the flowers, pick the petal colors you would like, stack and fold the tissue paper multiple times. Draw a flower shape on the top paper and cut along the lines. You can do large petals, tiny petals or anything in between. Set the flower cutouts to the side for later. Cut your foam block to fit into the bottom of the bag. Remove the cake pops from the fridge and melt a small chunk of chocolate for a minute. Dip the dull end of the skewer stick into the melted chocolate and then press into the top of the cake pop. Complete all the cake pops and place in fridge for about 15 minutes or until the chocolate is completely set up. Remove the cake pops from fridge and melt .5 pound of chocolate according to package directions. Dip each individual cake pop into the melted chocolate. Try not to swirl and tap the cake pops because they may fall off the skewer. Just a quick dip down and back up should do the trick and place in foam. Toss some of the sprinkles on top and let dry. Once dry, I transfer the cake pops into mugs to stay propped up and place the foam block into my bag. One by one, take a cake pop, 3 pieces of the tissue flowers and poke a hole in the center of the flowers with the sharp end of the skewer pulling the flowers up towards the top. 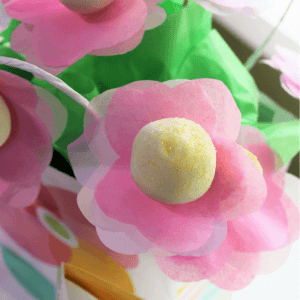 Place each flower cake pop into the foam on the bottom of your bag. Fill the bottom of the bag with 2-3 pieces of green tissue paper. 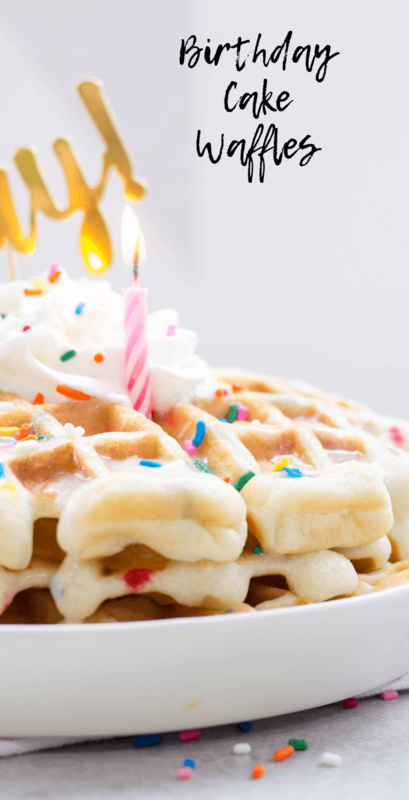 For more Mother’s Day inspiration and ideas, check out the American’s Greeting’s website HERE and spread the happiness. Bake the cake according to box directions. Crumble 1/4 of the cake into a bowl. You can place the remainder into the freezer for later use. Mix in 1/4 cup strawberry frosting. Crumble and mix with your hands. Use a cake pop press mold or a cookie scoop to mold the cake pops. I use the cookie scoop and place cake in hands to press together and roll into a bowl. Place cake balls onto a cookie sheet and let cool in fridge for one hour. Heat a small chunk of white chocolate for one minute. Dip the dull end of the skewer into melted chocolate and press into top of cake ball. Let chill in fridge until the chocolate has set up. Cook the remainder of the white chocolate according to directions. Dip each cake pop into chocolate, place sprinkles over top and place in the foam to let set. Put together your cake pop bouquet. 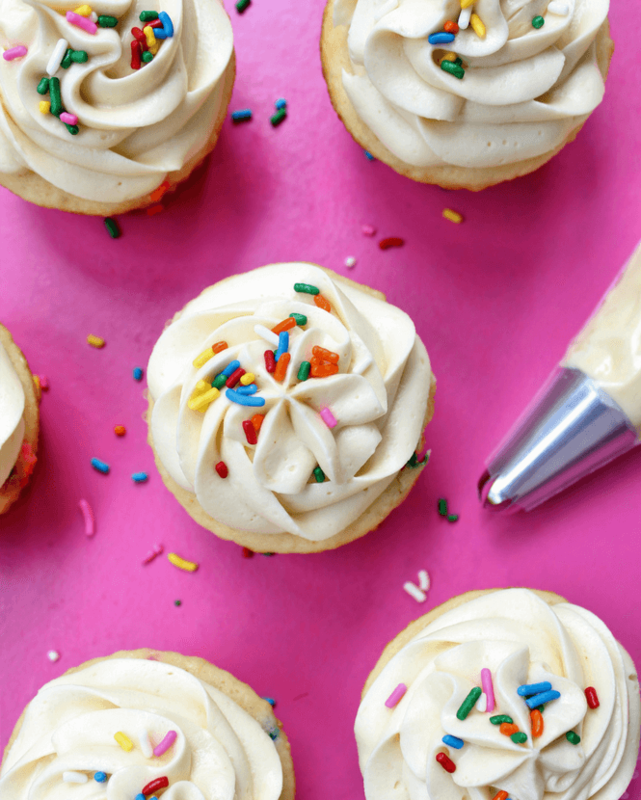 Cake Batter Frosting and Funfetti Cupcakes is a perfect Birthday treat! Made from a simple box cake mix (yes, box cake) with some ingredient swaps and topped with a yummy cake batter buttercream frosting. July in my family has a bunch of Birthdays. Every week we celebrate multiple and one is my sons! 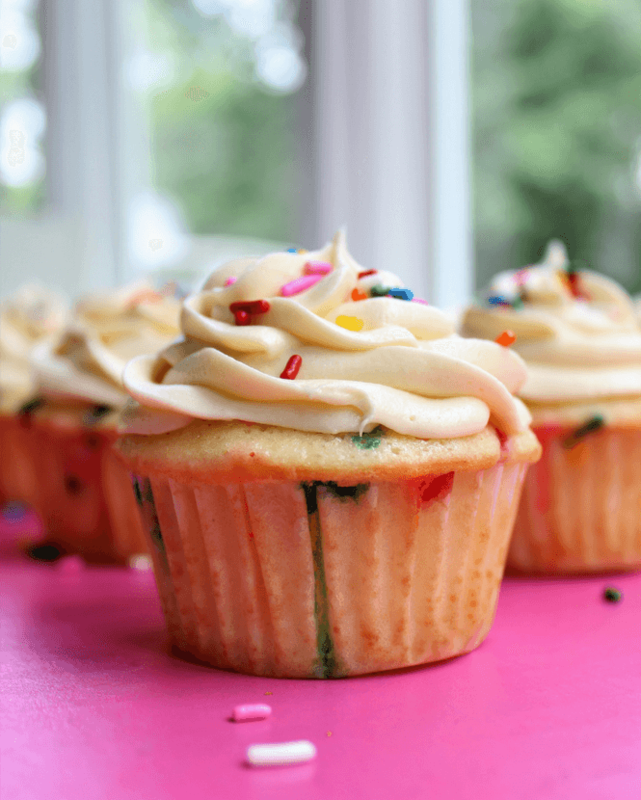 This year we made Cake Batter Frosting and Funfetti Cupcakes because they are simple to make, delicious and fun. 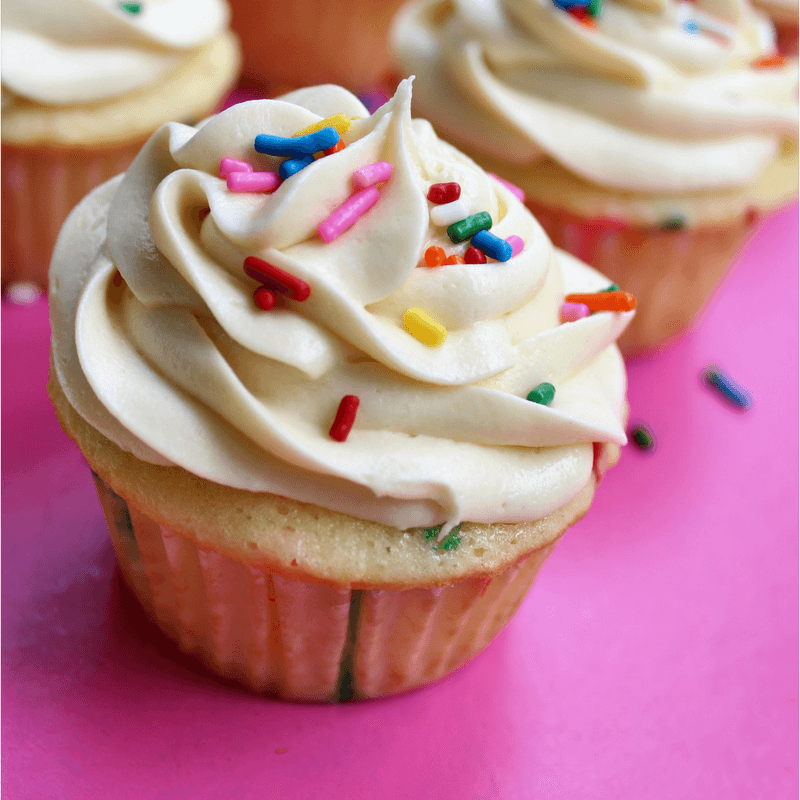 We actually went a step further with these cupcakes and make Cake Batter Cupcake Milkshakes. Toss a cupcake into the blender with vanilla ice cream, milk and blend well. 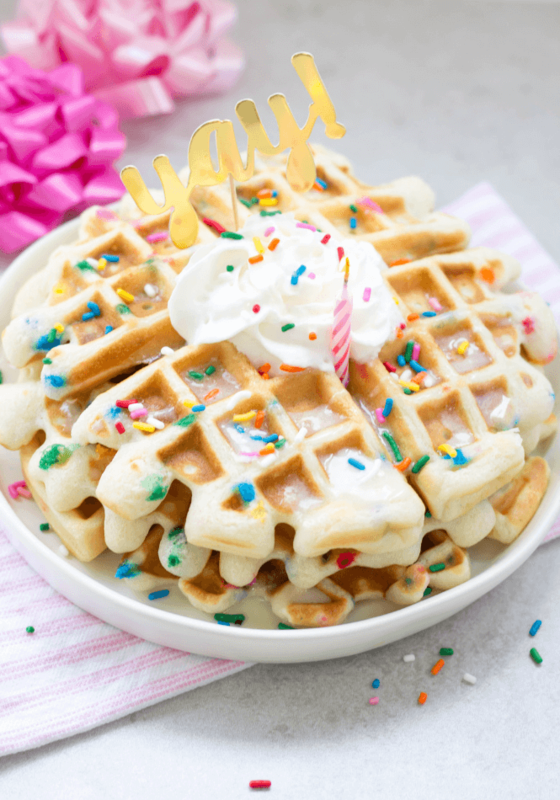 Top with whip cream and sprinkles. Crazy good! 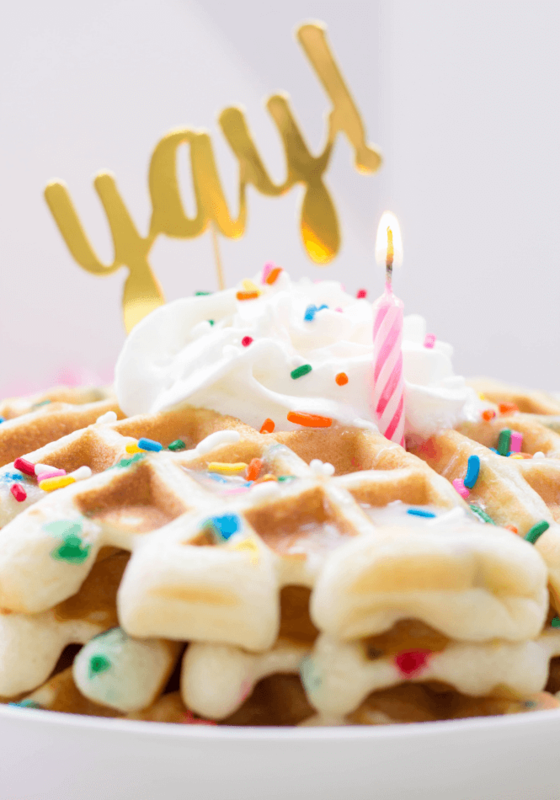 You may certainly buy the funfetti cake mix and follow the normal directions and just opt out of the sprinkles within the cake itself. 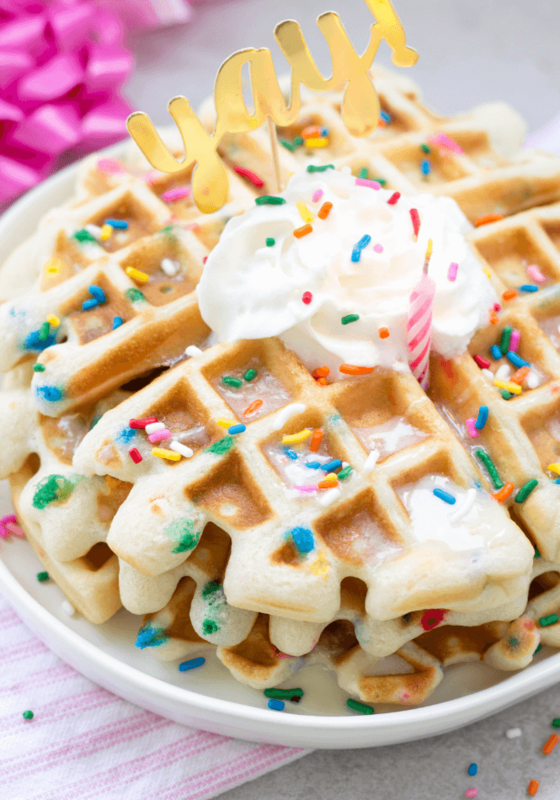 I like adding my own sprinkles however because it is more colorful. 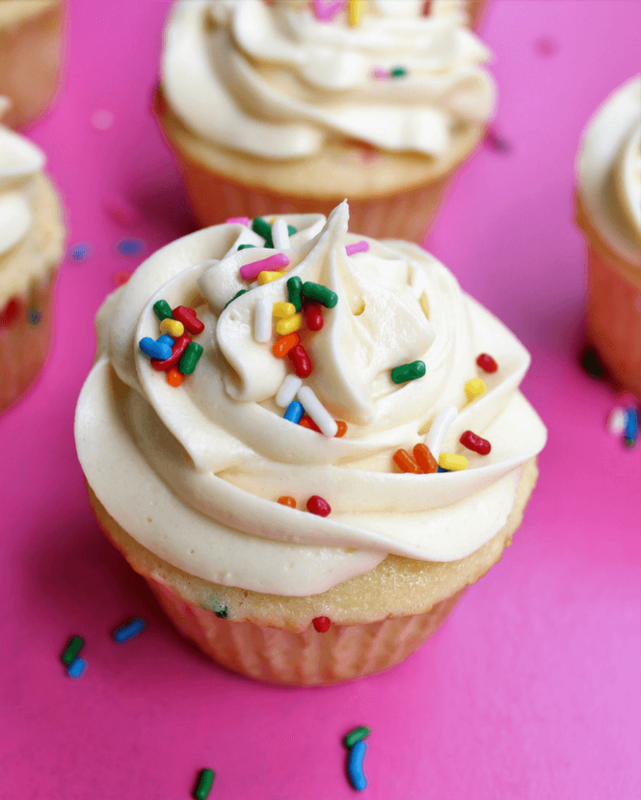 These cupcakes are really all about the Cake Batter Frosting. 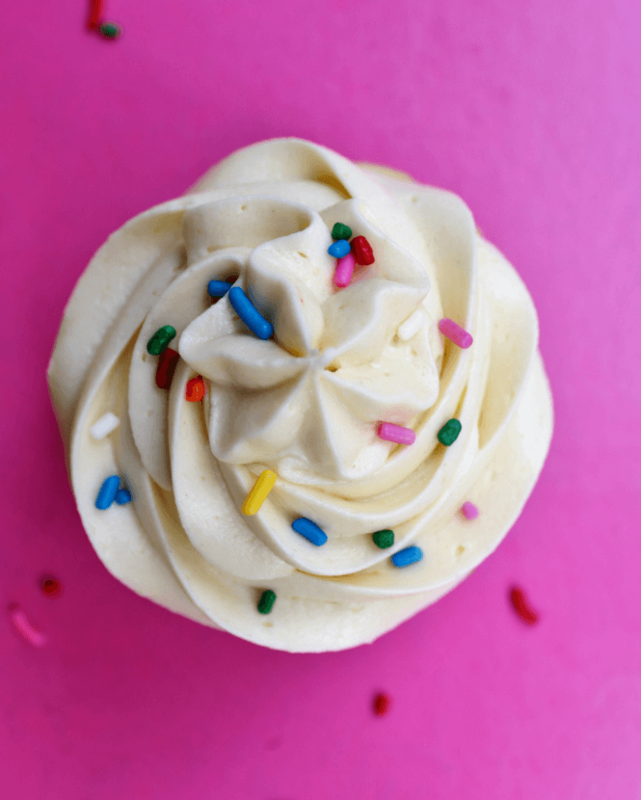 This stuff is seriously good and a really simple frosting to throw together. You are essentially making a basic buttercream and adding in yellow cake mix (from a box). The cake mix gives it just the right amount of cake flavoring. When decorating cupcakes, I always use an extra large or large tip. Start in the center and work your way around and upwards for a really full and pretty decorated cupcake. Gather ingredients, 2 large bowls, mixer, cupcake pan, cupcake baking cups, pastry bag and tip, and measuring cup. Begin cupcake mix. Add one box cake mix into large bowl with 3 eggs, 1 cup whole milk and 1 cup melted unsalted butter. Use the mixer until ingredients are thoroughly mixed. Put cupcake baking cup liners into the cupcake pan. Tip* Use an ice cream scoop to measure out cupcake mixture into liners. Add your mixture into each liner filling half way. Put cupcakes into oven for 15-18 minutes. Allow cupcakes to cool and then start frosting. In a large bowl, add 3 cups powdered sugar, 1 cup yellow boxed cake mix, 2/3 cup heavy cream, 1 teaspoon vanilla extract and 12 tablespoons room temperature butter. Mix all frosting ingredients until silky. If mixture seems thin, add more powdered sugar. If too thick, add more creamer. Put frosting into a pastry bag with a frosting tip of choice. Frost each individual cupcake. Make sure cupcakes are room temperature before frosting. 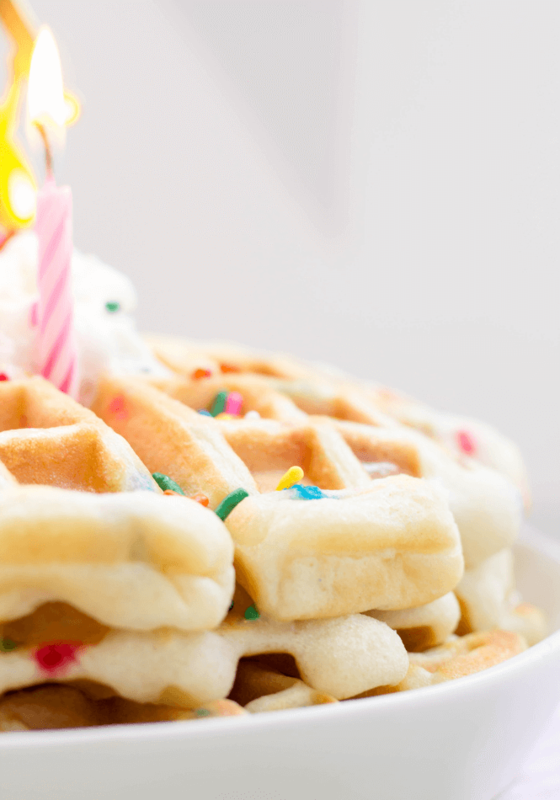 Add sprinkles, cookies or anything else you like to decorate and enjoy!